A great camera position in front of the White House. The vegetable garden is just to the left of the camera view. their son Patrick and their unnamed stillborn daughter. An eternal flame, lit by Jacqueline Kennedy at JFK's funeral, burns behind them. from WW1, WW2, Korea and Vietnam. (In 1998 the Vietnam soldier's remains were exhumed and identified by DNA testing. lying in stately rows on rolling green hills. The National Mall is a rectangular open area national park that sits right in the middle of 'downtown' Washington DC. The Capitol Building and the Lincoln Memorial are situated on each end of the park area with the Washington Monument sitting in the middle. Ashlee and I spent a gorgeous hot morning in the sun walking one half of this area, looking at all the war memorials that Washington does so well. So different from when I was here eight years ago in March - I remember freezing in the cold wind and wearing my thick coat, scarf and gloves with not many people around. On this day it was in the low 30s (degrees Celsius - about 88 degrees Fahrenheit) and the sun had full show with no clouds. Humidity was high as well and I was sweating in my shorts and singlet - very different weather to my first visit! In actual fact, the monument is being renovated and fixed after earthquake damage caused in 2011. There were heaps of school groups on excursions and people visiting this memorial. 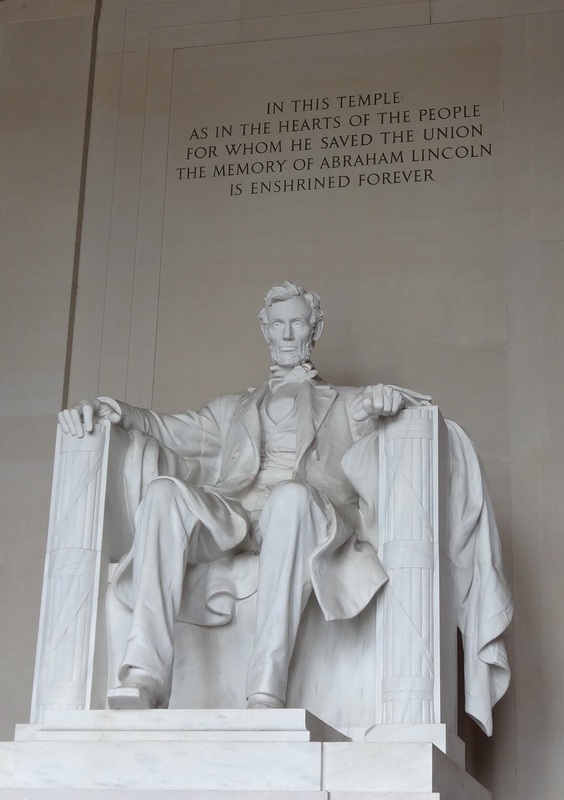 A very busy place - inside was a huge crowd of people taking pictures of the statue of Lincoln (below). The soldiers are very lifelike as they stand (walking) through the paddy. Panoramic view showing the detail of the memorial. One place that was a must visit was the Smithsonian Natural History Museum. It has a huge range of different exhibits that were really interesting to see - mammals, fossils, gems and mummies were some of the cool things to explore and learn about! Looking down at the atrium entrance - and the giant elephant that greets you! This little guy just looked so funny! Above our heads were these two...... took you by surprise! The coral reef - hello Dory and Nemo!! Very cool picture of a far away galaxy! The Hope Diamond....... the most famous diamond in the world! 45.5 carats of deep blue colour. There were these two other actual mummies in the museum as well! It is a very imposing building, even from this far away!! We also visited the Old Post Office Building and went to the top floor to see the views of the city (since we couldn't go to the top of the Washington Monument as I had planned........(I'm finding this photo for you! I'll update when I do).